What does Bahamian fantasy and myth look like? What magic or horror happens when the divides between animal and human seem to dissolve? 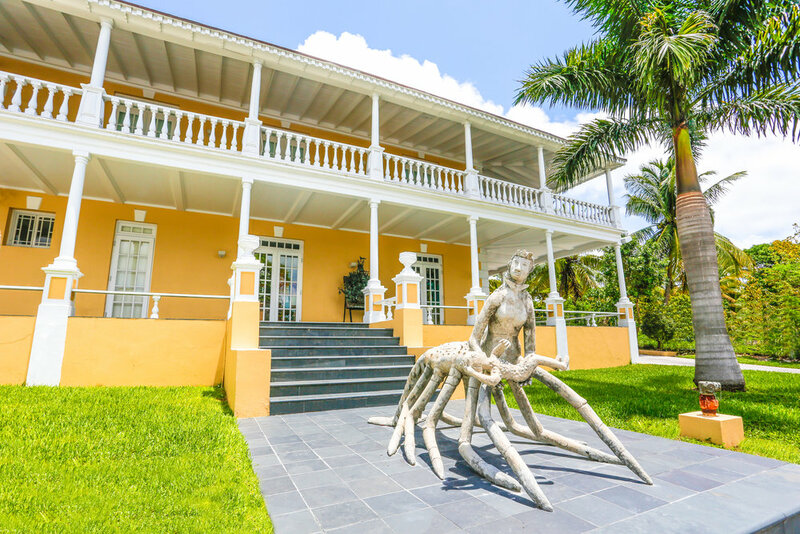 What then must Wellington Bridgewater have been thinking when he made the “Crawfish Woman” (c2000) who lies on the Southern steps of the NAGB’s Villa Doyle. Was he thinking that this lobster-lady was like the nefarious lusca, sucking water in and out of blue holes to capture unlucky divers and boats with the power of the oceans. Or was she more like the chickcharney, a generally benign beast who, once wronged, would cause you harm. We have a few things to go off to spin stories in this country of oral traditions, and this gives us rich ground for looking at the context that Bridgewater’s half-human woman exists in. We know of mythological creatures in Bahamian folklore like the lusca. The elusive and terrifying lusca - half shark, half octopus - is perhaps the original sharktopus before Sci-Fi got its hands on the idea, though arguably may have been better left in blue-holes from our legends. Blue holes have been revered spaces in The Bahamas from Arawak and Lucayan times, then acting as burial grounds, and now they are respected for the way they hold the power of the unknown for so many of us. Whether they are spewing out water from their dark, cold depths, or sucking you in - most know not to mess around with blue holes though they are of course generally safe for comfortable swimmers. “Crawfish Lady” (c2000), Wellington Bridgewater, concrete, 9’ x 5’3 x 5’6. Part of the National Collection. And then there’s the chickcharney, with its devil-red eyes and a small, humanoid form. The legends vary from person to person and island to island in regards to how bird-like or how human the creature may be. Generally, we understand it to be fairly short, with those ruby eyes, and that they are benevolent little beings when you show respect, but if you leave your “broughtupcy” at home then you’ll wind up with your head spun around. This is all story, tales, but something about the chickcharney reminds us of an all too important lesson - how we treat those different than us, who look different than us. Born in Nassau in 1948, Bridgewater is an intuitive artist - self taught and generally receiving little institutional recognition until later in his career, as is common with many intuitives the world over. Bridgewater began producing work in his early 40s and the religious themes are easy to see in his paintings of biblical scenes - sometimes almost comically so. There are works depicting the end of days and the rapture in unnerving and often horrifying scenes, but then there he also paints a Black Moses on the ark, and though there may be not be much sign by way of the animals aboard, he very helpfully paints their sounds in onomatopoeia alongside - moo’s included. He was the first Bahamian to show at the American Folk Art Museum in New York “Saddam Hussein as the Nine Headed Serpent in Revelations” (c2008) - a flair for the dramatic for sure, but the playful drama does nothing but add to the love of this practice. The NAGB campus show that his concrete sculptures present a different side of things. The fantastical half-human beings are sometimes religious, such as the “Angel Blowing His Trumpet”, but his “Serpent Lady” and “Crawfish Lady” lay somewhere between human and animal, disconcerting and magical. How does such a deeply religious man invent such wild women? Bridgewater is not just heavily influenced by his faith, but also by divine dreams and visions he channels. The “Crawfish Lady” (c2000) is holding a child, and though her multiple legs, and spiny articulated tail may be disconcerting, she has a softness to her face as she looks down at them. As Ashley Knowles, former Assistant Curator at the NAGB, noted in her own musings on the work, his monster-madonna is reminiscent of the most iconic images of mother and child - Mary and the baby Jesus. Blasphemy to some, playful reimaginings to another, the work shifts from formidable crustacean with child fleeing her grasp to that of a mother cradling her writhing child in her arms. The usually spiny crawfish has their spikes softened when we consider them in relation to Bridgewater’s overall body of work. Made of concrete, rebar and wire, these works also play to their own materiality. Concrete, while not the most sensitive material for the environment, also has a hell of a lot of going power in these parts. This single mother, who stands at the height of many women, and her baby have survived every hurricane since their placement on these grounds in 2004 aside from small patch-ups performed by the artist himself. Bridgewater’s work is representative of the colourful characters that we invent in Bahamian storytelling and dreamtellings, but also of the way that “everyday” folks have a creativity that is palpable throughout communities if it isn’t necessarily always visualised. If we all had the deftness of hand that Bridgewater possesses to make these smooth, soft, and spooky figures in spaces, then Bahamian oral tradition might just begin to be visually illustrated in the multiplicity it holds and deserves.